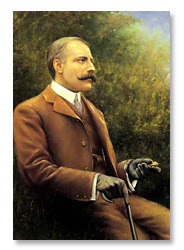 Edward Elgar was an English composer during the late Romantic era of music. As a youngster in Worcester, England Edward learned how to play the violin and piano. His development in music led him into composition. He was a great composer who is probably most well known for his Pomp and Circumstances Marches. His beloved Enigma Variations is probably a close second. Elgar was knighted at Buckingham Palace on 5 July 1904. Ever since that time he became known as Sir Edward Elgar. When Sir Edward Elgar released his beautiful Enigma Variations, musicologists all over have been trying to figure out why did Sir Edward Elgar name this the enigma? What is the puzzle [enigma] in the music? Some have said there must be some hidden theme [melody] in the music which answers the enigma, but to my knowledge, while many have come up with their theories, there has been no definitive conclusive answer to what is the enigma of this theme and variations. Sir Edward Elgar wrote himself in a program note for concert goers in a performance in 1911, "This work, commenced in a spirit of humour & continued in deep seriousness, contains sketches of the composer’s friends. It may be understood that these personages comment or reflect on the original theme & each one attempts a solution of the Enigma, for so the theme is called. The sketches are not ‘portraits’ but each variation contains a distinct idea founded on some particular personality or perhaps on some incident known only to two people. This is the basis of the composition, but the work may be listened to as a ‘piece of music’ apart from any extraneous consideration." I think when anyone listens to this, they don't care why Sir Edward Elgar named this as he did, they just love the grand music. I am probably alone in this, but to me, when I hear the first four notes of the original theme [and all throughout the music] I keep hearing in my head: 'you don't know me' .... and I can't get that out of my head. When you listen to the theme, see if you can also hear 'you don't know me' coming from the music like I do. There are 15 movements in the enigma variations. Movement one, Andante, has the original "enigma' theme and then 14 variations of that theme follow in movements two through 15. In movement 10, Adagio, is the 9th variation known as the "Nimrod." The Nimrod variation is one of the most beautiful pieces of orchestral music you will hear. That is why I have played this before on the Tales classical music weekends. The exciting final movement #15 with the 14th variation is scored finale, allegro. With beautiful music like this, is it any wonder why Edward Elgar was given the honor of knighthood in England? Sir Edward Elgar sure sounds appropriate to me. As I always say on the Tales please turn up the volume and enjoy this beautiful "enigma".